Simon and Schuster's The Last Ninja is a continuation of a long-running series that originally appeared on the Commodore 64 and later the NES back in the late 80's. Fans of the original games will hardly recognize the Xbox edition, since the game has undergone a radical makeover thanks to today's improved technology. The gameplay will meld various styles of play with a strong plot that mixes traditional mysticism, fantasy elements and dramatic cut-scenes to create a cinematic experience that should immerse the player into the mysterious, shadowy world of ninja assassins. Join us as we preview this upcoming title and let you know what it's all about. Between Sega's Shinobi and Tecmo's upcoming remake of Ninja Gaiden, traditional martial arts titles have made a comeback. Simon & Schuster Interactive is also going into this suddenly hot genre with The Last Ninja. While the game was first announced more than a year ago, S&S delayed the game but it looks like it is finally coming out this fall on the Xbox. The delay may have been frustrating, but many improvements have been made that should make the wait worthwhile. 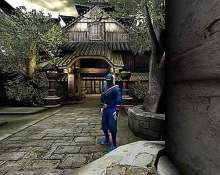 Unlike many other action-oriented martial arts games, The Last Ninja's gameplay blend different genres with action, adventure, strategy, exploration, stealth and combat action. This should leave players satisfied with a challenging and interesting game that should offer a distinct take on the genre with many mind-teasing puzzles to beat. The Last Ninja will have a strong plot with clearly defined endings that should make for a more cinematic experience. This means it is not going to be the usual mindless hack and slash title, and will offer a much deeper experience. Your ninja will receive some help along the way and can use your Dragon Magic spells to clear enemies from certain areas. 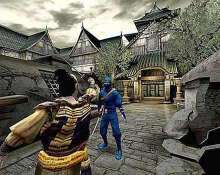 The enemies themselves will be harder to beat than most foes in ninja games to date. This is because the developers are implementing Natural AI Behavioral Algorithms. This Natural A.I. allows them to react and move intelligently to your moves. The game will be fairly linear, but you will have plenty of freedom to move around and complete objectives to finish each level. 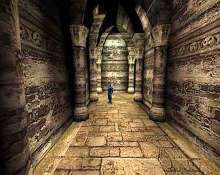 Far too many 3D action titles have suffered from poor execution thanks to bad camera angles and poorly designed levels. The Last Ninja is looking to buck that trend with some intelligent design choices that should lend it a cinematic feel. It will implement multiple camera angles, beautifully rendered environments, and motion captured characters to achieve this goal. Dynamic special effects should enhance the action with dramatic camera movements, intense in-game cinematic cut-scenes creating an epic feel. A full 3D collision system will allow true interaction with the backgrounds, allowing you to bust crates and gates, as well as anything else you might face. 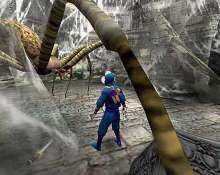 In addition, the characters and creatures in the game will be rendered realistically thanks to the scalable boned animation system. This engine will also allow the Ninja take on the personality of non-playable playbable characters by applying their unique animations to that character. The Last Ninja's sophisticated collision detection system will let players to interact fully with any objects and opponents they come across, making the environments seem more alive and immersive. Additionally, sophisticated bone-modeling techniques will allow opponents to move as they would in real-life, heightening the realism. Adding to the production polish, the musical score and 3D sound effects should enhance the game's excitement. The early screenshots look really good and if the finished title lives up to this potential, Last Ninja should be one of the more impressive Xbox titles, from an aesthetic standpoint. The Last Ninja promises some sophisticated AI. This means that the enemies are going to be intelligent and able to react to your movements in a believable and realistic way. Since these enemies can take on forms of other creatures, this should make for some impressive adversaries. The Last Ninja's intuitive control system shouldn't intimidate novice players but veterans should find many nuances to master. The combat system will be flexible and allow players to develop their own unique style. You'll be able to use both hand-to-hand and weapons based moves during the game if you want to face them head on. The Last Ninja will also offer players an array of weapons and powers to use including long and short-swords, ninja stars and other projectiles. This should give the player plenty of variety in their attacks and reduce the repetition. While the combat system is deep, attacking enemies head-on won't always be the wisest choice, since some attack fiercely and are difficult to beat without taking on a lot of damage. In these cases, players can implement stealth techniques to go around the enemies without being detected. The Last Ninja's stealth techniques will allow players to move undetected to perform surprise attacks by sneaking up behind foes. In addition, players can use the ninja's Dragon Magic to call up mystical force attacks and other spells to clear out an area without suffering a scratch. The use of magic is going to be restrained, but these attacks are going to be quite powerful, and especially useful when confronting boss characters. In addition to the technical merit of it's character models, S&S is promising to pay a great deal of attention to the atmopsherics and overall feel of the game. The Last Ninja's production values will reflect a great attention to detail and the creation of dramatic tension. The overall design is evocative and the levels seen to date are impressive in detail and richness. The Last Ninja should sport an interesting mix of fantasy and mystical element that should make for a unique experience. Dramatic cut-scenes and dynamic level designs, plus and array of interesting creatures and foes to face should make for an exciting game. While the visuals sound impressive, the bottom line of creating an intense gameplay experience hasn't been neglected. The Last Ninja should implement an intuitive control system that will allow players to mix of different attack styles to keep opponents off guard. This sophisticated engine should keep the action from getting too dull. Furthermore, The Last Ninja's elaborate Dragon Magic system should add depth and strategy to the title. While The Last Ninja doesn't have the brand-name that players have become accustomed to, it still looks like an excellent title. It looks like a visually sumptuous title that mixes beautiful environments with impressive character modeling to create an impressive gaming experience. The graphics look fantastic but the game will also include intense swordplay, multiplayer action and cool stealth moves that should make for an exciting gameplay experience. This is definitely looking like a solid title for fans of the genre. While there will doubtlessly be inevitable comparisons to Tecmo's Ninja Gaiden, The Last Ninja should be able to cut out a nice niche for itself among Xbox owners.